I'm pretty sure my friend Puck will be interested to hear this track, as it is related to a movie - and he is seriously into movie soundtracks. But I've been searching for this one for a long time too, even leading to buying the wrong 'King Kong' not so long ago. Jimmy Castor was born on June 23, 1947 in New York. 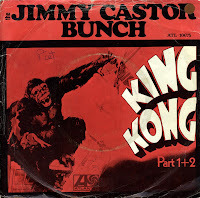 He formed the Jimmy Castor Bunch in 1972 and signed a recording contract not long after that. Their debut album 'It's just begun' was an immediate success in America, featuring two hit singles. In 1976, they hit it big worldwide with this single, 'King Kong', a rather bizarre track referring to the ape in the movie of the same name. In the Netherlands, the single reached number 5.